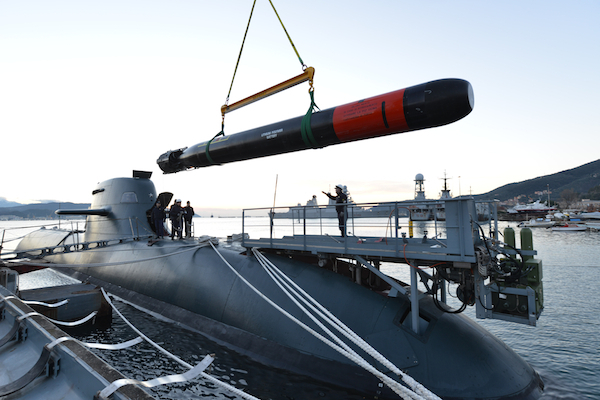 LIVORNO, Italy --- On 28 January 2014 the new Black Shark Advanced (BSA), produced by WASS was launched for the first time ever from the submarine SCIRE’. The torpedo launched in “Push Out” mode (water ram expulsion system, which ejects the torpedo by means of high water pressure), was equipped in a totally innovative way, thanks to the new Lithium-Polymer Battery. The launch, called “Short-Fire”, took place in the La Spezia gulf and was aimed at testing the WASS progresses in the frame of the project “New Heavyweight Torpedo”, developed in cooperation with the Italian Navy. The successful launch represents another step ahead, toward the acquisition by the Italian Navy. Over the next few years, the Black Shark Advanced is expected to replace the old A-184 Heavyweight Torpedo, now supplied to submarines of the Italian Navy, increasing significantly the ability to defend the waters and the Italian homeland. WASS - Whitehead Sistemi Subacquei – has been part of Finmeccanica since 1995. The company, which mostly employs high degree-qualified engineers, with premises in Livorno and Napoli, is fully responsible for the design, development, production, integration and customer delivery. Whitehead Sistemi Subacquei is recognized world-wide as one of the leading companies for a wide range of underwater advanced systems.